Dance Commentary by Heather Desaulniers: "Arcane: A Tale of All Hallows' Eve"
It’s been exactly a year and a half to the day since I’ve seen Company C Contemporary Ballet in performance. In that time, the company has gone through a major overhaul, with a shift in its production model being perhaps the biggest change. Instead of a typical fall and spring season, Company C opted to move to a more project-driven system. For the first of these projects, Artistic Director Charles Anderson went all in - Arcane: A Tale of All Hallows’ Eve premiered this weekend at Fort Mason and runs until the 31st. Arcane is a brand new one-act narrative ballet, a Halloween story by Ben Bowman and Anderson. It is an ensemble work, complete with principal dancers, a corps and a children’s cast. An original score by Mike Krisukas is played by a live orchestra, conducted by Mary Chun; the stage is filled with phenomenal design elements – costumes by Laura Hazlett, lights and scenery by Patrick Toebe. And a narrator, John Hale, frames the action throughout. The ballet follows the Halloween night sojourn of its title character, Arcane, a celestial being danced at this performance by Phyllis Affrunti. Using dance and text, a collection of short scenes relays her travel - those she meets, the scenes she encounters, the events she creates through her spellbinding forces. She is joined by an astrologer. We are told that he is Arcane’s human proxy, though that part of the story gets a little lost and so the astrologer comes across as more of a traveling companion. Arcane was a little slow getting going, but by the third vignette, the cast had hit their stride. 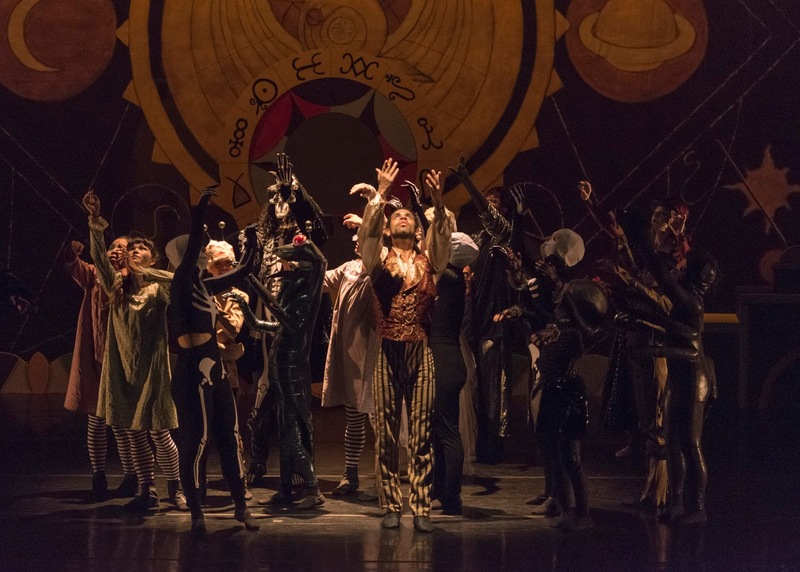 As Arcane and the astrologer, Affrunti and Taurean Perez did very well, especially navigating their complicated, and sometimes busy, choreography. But the most impressive group of dancers was the corps, who in a single hour had to embody so many different characters (stars, pumpkins, ghouls, skeletons), each with unique choreography and complex costumes. In fact, my favorite variation was the orphan trio of Alice Cao, Alysia Chang and Colleen Soltys. Technically, sharp relevés and échappés met expansive turns and waltz steps. And the three were spot on in their character portrayal. A number of other standout moments deserve particular mention. As Arcane’s journey occurred over a single night, different clock motifs were crucial to the ballet’s storyline. Anderson’s take on time was incredibly innovative and clever. The light show duet halfway through absolutely thrilled the audience. It was cool and different, but for me, went on a little too long. At the beginning of the Halloween ball scene, there was a lively dance for the entire group – quirky movement side by side with traditional ballet. Though in instances like this one when the whole cast was present, the Cowell Theater stage appeared a bit small. It looked like they didn’t quite have enough room for some of the extensions and traveling steps. Company C Contemporary Ballet’s Arcane: A Tale of All Hallows’ Eve is entertaining, fun and very fitting for the end of October. Though there are a few darker moments (like the dead bride dance), overall, it is a family-friendly way to access contemporary ballet this Halloween season.